How Do Pool Chlorinators Work? Simply put, chlorinators make use of a process called electrolysis that takes dissolved salt (sodium chloride, also known as table salt) and splits it into hypochlorous acid and sodium hypochlorite. Hypochlorous acid and sodium hypochlorite are the chemicals responsible for cleaning the water, both destroying bacteria and helping to prevent algae growth. The best part about this process though, is eventually (due to chemical reasons too in-depth for my understanding) the hypochlorous acid gets converted back to salt (sodium chloride) removing the need to continuously add salt. It is a self-sustaining process. There are occasions when salt will need to be added which are when the salt gets diluted too much either from topping the water up or overfilling the pool or spa. For further in-depth reading on the chemical reactions and the processes used to create the reactions, here is a detailed article on Wikipedia – Salt Water Chlorination On Wikipedia. What type of salt goes into the water? It may surprise you to know that the salt which you need to use is ordinary table salt. Well mostly. Sodium Chloride is a chemical compound that common salt is primarily composed from which is used in salt water pools and spas. Pool salt is generally available in large 40 Lb bags. How much salt do I need to put into the water? Various chlorinators have different minimum and maximum salt level requirements. Check the manufacturer’s specifications for correct amounts as some chlorinators have been designed to stop functioning if the salt levels are outside their operating range to prevent damage to the cell. As a general guide however, the average is around 3000 – 4000 ppm (parts per million). If you are converting your pool or spa to salt water for the first time, or it has been recently filled with fresh water then you will need to calculate how much salt is required based on the volume of your pool or spa. If your pool or spa is already salt water, then you should have your water tested for salinity levels and then work out how much salt you need to add based on the result of the test. A 40,000 gallon pool will require approximately 25 bags (40 Lb) of salt to convert fresh water to salt water. Will the water taste and feel salty like the ocean? No, if the salt levels are maintained around 3000 ppm then the salt will be unnoticeable to most people. Compared to the ocean, typical salt water applications in pools and spas are 1/10th that of the ocean. In other words, the ocean can reach levels of 30,000 ppm (obviously varying depending on location). Even human tears are more salty at around 9000 ppm. If your pool or spa water has salt levels reaching 5000 ppm or higher, then the salt in the water becomes noticeable to taste. 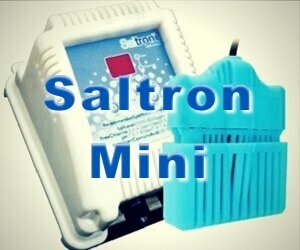 What maintenance will I need to do to a salt water chlorinator? Earlier chlorinator systems required the chlorinate cell to be cleaned as the electrolysis process would attract calcium build up on the cell plates. This could be identified as a whitish substance and would hamper the performance of the cell. Cells had to be removed from their housing and submerged into an acid formulation to remove the calcium. Modern systems now feature a self-cleaning function which the control unit will conduct automatically. This is achieved by reversing polarity on the cell electrodes. Read the features and functions of our chlorinators carefully to make sure the one you are considering has this functionality. One consideration that needs to be taken into account is your water temperature and you can read about it in an article we have written – A Guide To Temperature Control When Using Salt Water Chlorinators. So I don’t need to do any other more maintenance to my pool or spa? Unfortunately, your pool will still require maintenance. Most importantly you should be checking the pH level regularly. Other items to test will be salt levels, chlorine levels and alkalinity. Regardless of pool or spa type, your local pool center can carry out water tests for you and depending on results advise you on chemicals required to have your water at it optimum.